Notes: Transport your synthesiser in style. Once folded down into transport mode, your RackBrute 3U or 6U, along with your MiniBrute 2 or 2S, will fit snugly inside this high-quality padded bag. It also features external compartments for adapters or small controllers. 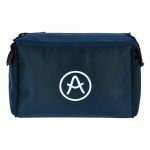 Fully loaded modular cases can get heavy, so we've also included a hard-wearing shoulder strap to make things a little easier. 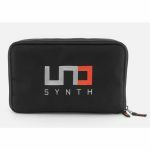 Notes: To protect your UNO Synth when you're carrying it around, here is the UNO Synth Travel Case, a durable, 100% polyester case featuring a stitched-in UNO Synth logo. Notes: This low-cost pedal can be used for sustain when connected to the damper input of Korg keyboards. 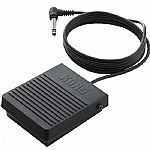 It can also be used for the assignable footswitch jack on Korg products, where it will provide various functions depending on the product's settings. The PS3 features a tough, molded plastic body with a non-slip rubber base. 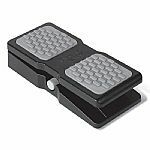 This reliable momentary footswitch can be used as an accessory with many Korg products to add extra functionality. Notes: Feel the need to express yourself fully? M-Audio's EX-P expression controller pedal works with all M-Audio MIDI controllers that have an expression pedal input. A built-in polarity switch insures compatibility with most other brands of controllers and keyboards. Use the EX-P to control any assignable variable MIDI controller value including volume, modulation, panning, filter sweep and more. Durable molded construction with integral cable. Notes: Moog's Minitaur Rackmount Kit is pretty much essential if you're gigging with your Minitaur. In the studio, you can tidy up and enhance your productivity by getting your synth off the desktop and into your rack. 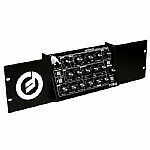 The Minitaur Rackmount Kit gives you the options of positioning your Minitaur either flat or angled, so your ergonomics will always be ideal. When you're playing out, the Minitaur Rackmount Kit lets you easily mount your Minitaur in a rack case, affording it protection from the rigors of the road. Notes: Mount 3 Mother-32 synthesizers together vertically for maximum modularity and synthesis capabilities. Also accommodates 60HP Moog Eurorack cases. Notes: Change the look of your SYSTEM-8 with these high-quality replacement side panels made of brushed aluminum. Sold as a pair. Notes: Change the look of your SYSTEM-8 with these high-quality replacement side panels made of solid wood. Sold as a pair. - Contains quick ref for Odytron functions and an overview of inputs and outputs of Odytron and Oscidrum. - Allows alternative software versions to be uploaded to the Oscitron. These can be downloaded from the Soulsby Synths website. Notes: This new version holds 3 Roland Boutique synths. This will also fit the TR09, TR08, SE02. SH01a and TB03 etc (you will need to remove them from the additional case that they come with). The stand has been made from oak veneered MDF wood and is connected via 12x allen head Confirmat screws (key and screws provided) into an MDF wooden bar. These are a great addition to the Boutique synths and give a much nicer look and better working angle. The Boutique synths are gripped in place by the sides of the stand, so do not fully tighten screws until units are placed inside. Make sure you do this on a flat surface to ensure the feet are correctly aligned. The stand will need assembly as they will be sent flat packed - all screws, tools and rubber feet are provided. These are a great addition to the Volcas and give a much nicer look and working angle, you can also flip them round to have a much steeper angle if you prefer. The Volcas fit snuggly into the stand so do not fully tighten screws until Volca is placed inside then tighten screws to hold in place firmly. Make sure you do this on a flat surface to ensure the feet are correctly aligned. Notes: This version holds 3 Korg Volcas. The stand is made from oak veneered MDF and is connected via 12x allen head Confirmat screws (key and screws provided). These are a great addition to the Volcas and give a much nicer look and working angle. You can also flip them round to have a much steeper angle if you prefer. They can also be painted with ease or stained with wood stain to suit your studio. The Volca fits snuggly into the stand so do not fully tighten screws until it's placed inside, then tighten screws to hold in place firmly. Make sure you do this on a flat surface to ensure the feet are correctly aligned. The stands need assembly as they will be sent flat packed. All screws and tools are provided - this includes small rubber feet. Notes: Waldorf Blofeld and Pulse 2 oak veneered stand. This new version has been precision machined to ensure a quality fit and finish. Holding 2 Waldorf synths, the stand not only gives a much better working angle but also helps free up much needed space in your studio. The design leaves plenty of room for all cables to be easily attached or removed. The synths fit snuggly into the recesses on the stand and is then secured using the supplied confirmat screws. Allen key and rubber feet also included. Notes: Holds 3 Roland Boutique synths, precision machined with a CNC router so the boutiques lock firmly in place. Will fit all Roland Boutiques - however, you will need to remove them from the additional case (DK01). The stand has been made from Oak Veneered MDF wood and is connected via 8 x Allen head Confirmat screws (Allen key & screws provided) into an MDF wooden bar. These are a great addition to the Boutique synths and give a much nicer look and better working angle. Notes: Holds 2 Korg Volcas. These are ideal if you have the full range of Volcas as 2 stands can be put side by side to create a rack. The stand has been made from MDF wood and is connected via 8 x Allen head Confirmat screws (Allen key & screws provided) into an MDF wood bar. A great addition to the Volcas, offering a much more desirable look and working angle. You can also flip them round to have a much steeper angle if you prefer. They can also be painted with ease as in to suit your studio. Notes: Holds 2 Roland Boutique synths or drum machines, ideal if you have the full range of Boutique Synths. This stand will fit ALL the boutique range, though the drum machines will need to be taken out of their docking station (DK01). The stand has been made from MDF wood and is connected via 8 x Allen head Confirmat screws (Allen key & screws provided) into an MDF wooden bar. These are a great addition to the Boutique synths and drum machines and give a much nicer look and better working angle. They can also be painted or stained with ease to suit your studio. The Boutique Synths & Drum Machines fit snuggly into the stand so do not fully tighten screws until units are placed inside then tighten screws to hold firmly in place. Make sure you do this on a flat surface to ensure the feet are correctly aligned. Notes: This new version of the Korg Volca stand has been precision machined with a CNC machine. A recess for each Volca has been cut into the sides so once assembled it becomes very strong and has great stability for live performance, giving you the peace of mind that your gear is safe. The stand is made from MDF and is connected via 8 x Allen head Confirmat screws (Allen key & screws provided) into an MDF wood bar. Can also be painted with ease or stained with wood stain to suit your studio. Notes: These are a great addition to the Volcas and give a much nicer look and working angle, you can also flip them round to have a much steeper angle if you prefer, they can also be painted with ease or stained with wood stain to suit your studio. These are a great addition to the Volcas and give a much nicer look and working angle, you can also flip them round to have a much steeper angle if you prefer. They can also be painted with ease or stained with wood stain to suit your studio. Notes: Holds 3 Roland Boutique synths, ideal if you have the full range. The stand has been made from MDF wood and is connected via 12 x Allen head Confirmat screws (Allen key & screws provided) into an MDF wooden bar. These are a great addition to the Boutique synths and give a much nicer look and better working angle. They can also be painted or stained with ease to suit your studio. Notes: This new version of the Korg Volca stand has been precision machined with a CNC machine. A recess for each Volca and the Korg SQ1 has been cut into the sides so once assembled this stand becomes very strong and has great stability for live performance, giving you the peace of mind that your gear is safe. The stand is made from MDF and is connected via 12 x Allen head Confirmat screws (Allen key & screws provided) into an MDF wood bar. It can also be painted with ease or stained with wood stain to suit your studio. Notes: This new version of the Korg Volca stand has been precision machined with a CNC machine. A recess for each Volca has been cut into the sides so once assembled this stand becomes very strong and has great stability for live performance, giving you the peace of mind that your gear is safe and won't fall out or move during use. This stand is made from MDF and is connected via 12 x Allen head Confirmat screws (Allen key & screws provided) into an MDF wood bar. The stand can also be painted with ease or stained with wood stain to suit your studio. Notes: Holds 3 Roland Boutique synths, precision machined with a CNC Router so the boutiques lock firmly in place. Will fit all the Roland Boutiques - however, you will need to remove them from the additional case (DK01). The stand has been made from MDF wood and is connected via 8 x Allen head Confirmat screws (Allen key & screws provided) into an MDF wooden bar. These are a great addition to the Boutique synths and give a much nicer look and better working angle. Notes: This version holds 2 Korg Volcas, which is ideal if you have the full range of Volcas as 2 stands can be put side by side to create a rack of four. The stand has been made from solid oak wood and is connected via 8x allen head Confirmat screws (key and screws provided) into an MDF wood bar. These are a great addition to the Volcas and give a much nicer look and working angle. You can also flip them round to have a much steeper angle if you prefer. The stand will need assembly as it will be sent flat packed - all screws are provided. Due to the nature of the material when assembling the stand the braces may split - this is perfectly normal and the stand will function as it should. Notes: This stand holds 2 Boutique synths. It has been made from solid oak wood and is connected via 8 x Allen head Confirmat screws (Allen key & screws provided) into an MDF wood bar. A great addition to the Roland range of synths, giving a much nicer look and working angle, plus now with more space for cables. Notes: Made from high quality oak, adding a touch of retro style to your synth. Each pair of cheeks is hand made and nicely angled to make the synth much more useable on your desktop. The end cheeks screw in using your original screws in the same place as the rack mounts or normal end cheeks. Notes: Custom made Solid Oak Behringer Model D end cheeks, fixed by removing the plastic end cheeks and replacing using the existing screws. The Oak has been oiled and should stay looking beautiful for a long time. These are a great addition to amazing Model D synth and it give a much nicer look. Notes: These end cheeks are a direct replacement for the plastic end cheeks on the Korg Microkorg Synthesizer. They have been made from solid oak wood and are fixed using existing screws. The Wood has been oiled and should stay looking beautiful for a long time. These are a great addition to the Korg synth and add a touch of retro style. Notes: These end cheeks are a direct replacement for the metal end cheeks on the DK01 docking station, they have been made from solid oak wood and are fixed using existing screws. The wood has been oiled and should stay looking beautiful for a long time. These are a great addition to the Roland Boutique range of synths and give a much more expensive look and feel. Notes: Hand made solid oak end cheeks for the Roland System 1M. Made from solid European oak, adding a touch of retro style to your synth. Each stand is ideally angled to make the System 1M much more useable on your desktop. Fitted using the original screws from your synth. Notes: These end cheeks have been hand crafted from Solid Oak to give your System 8 a much nicer look. The cheeks attach using the existing screws from the System 8 and takes a few minutes to add a touch of class to your synth. Notes: This new MK2 version holds 2 Boutique synths. The stand has been made from solid oak wood and is connected via 8x allen head Confirmat screws (key & screws provided) into an MDF wood bar. These are a great addition to the Roland range of synths and give a much nicer look and working angle and now there is more space for cables. The stand will need assembly as they will be sent flat packed, all screws are provided. The Boutiques fits snuggly into the stand so do not fully tighten screws until the synths are placed inside, then tighten screws to hold in place firmly. Make sure you do this on a flat surface to ensure the feet are correctly aligned. Due to the nature of the material if you overtighten braces may split - this is perfectly normal and the stand will function as it should. Notes: Custom made stand/end cheeks for the Moog Wekstatt 01 analogue synth. This stand allows you to have your Moog at a much more usable angle. The end cheeks have been made from solid oak wood and are connected via 4x confirmat allen head screws into an MDF bar (screws and key provided). These are a great addition to the Moog and give a much more expensive look and feel - the oak has been oiled and should stay looking beautiful for a long time. Notes: Custom built solid oak end cheeks for your drum machine. This stand has been hand crafted from solid oak to give your drum machine a much nicer working angle. The stand is assembled by connecting the side panels with 4x confirmat screws. Comes with fixings and an allen key to assemble your stand ready for use. Item will need assembly as they are sent flat packed, all screws and tools are provided, this includes small rubber feet. Notes: These end cheeks have been made from solid oak wood and are connected via 4x confirmat allen head screws (key provided) into an MDF bar. The Oak has been oiled and should stay looking beautiful for a long time. These are a great addition to the Roland Boutique range of synths and give a much more expensive look and feel. The stand will need assembly as they will be sent flat packed, all screws are provided. The Boutique fits snuggly into the stand so do not fully tighten screws until synth is placed inside, then tighten screws to hold in place firmly. Notes: This stand has been made from solid oak wood and is connected via 4x allen head Confirmat screws (key & screws provided) into an MDF wood bar. These are a great addition to the Waldorfs and give a much nicer look and working angle. The Waldorf Synths fit snuggly into the stand so do not fully tighten screws else you may split the MDF bar. Make sure to assemble on a flat surface to ensure the feet are correctly alligned. Flat packed - all screws and tools are provided. Notes: This stand allows you to have your Waldorf at 2 different angles depending on your taste. The end cheeks have been made from solid oak wood and are connected via 4x confirmat allen head screws (key provided) into an MDF bar. The Oak has been oiled and should stay looking beautiful for a long time. These are a great addition to the Waldorf Range and give a much more expensive look and feel. The stand will need assembly as they will be sent flat packed, all screws are provided. Insert screws and tighten with the allen key - as soon as you feel the screw begin to tighten or get all the way in then only use gentle force to finish the process. The Waldorf fits snuggly into the stand - so don't fully tighten screws until the Waldorf is placed inside, then tighten screws to hold in place firmly. Notes: This clear film display protection sheet is made for the Teenage Engineering OP-1 Synth. It protects the screen from dust and scratches and is very easy to apply. Notes: Display screen protectors for Teenage Engineering Pocket Operator range, pack of 3. Notes: Quality wooden sides for Vermona Mono/Kick/Filter Lancet. Looks great on your desktop. Notes: Quality wooden sides for a Vermona PERfourMER MKII. Looks great on your desktop. Note: Synthesizer is sold separately.